We have been on the market for over 70 years. The origins of the company date back to the 1930s when Sabino Campana opened a pastry shop in Torre Annunziata and decided to combine the production of freshly roasted fresh coffee next to the art of confectionery. Pasquale his son after having inherited his father’s business, continued over the years and until the 90s the coffee processing dedicating him also a “CamCaffè” brand. The Campana family has always pursued, with great passion and dedication, the roasting activity, a world made of intense aromas, precious beans, captivating aromas from all over the world that come together to form mixtures with a unique flavor. Now the third generation is represented by Raffaele and Paola Campana who are following the same philosophy inheriting the know-how necessary to pursue a product of the highest quality. Raffaele and Paola in November 2013 created the Campana caffè brand. In our roasting laboratory we make wonderful coffee blends of mainly Arabica (at least 50%) with a sweet, delicate, decisive and balanced aftertaste. For us, the roasting of coffee is a real art that is learned with time, with passion and with all the love to offer the public a fresh product. We adhere to a strictly traditional production process, using the best raw coffee on the market. We therefore place the utmost attention to the production process, starting with the selection of arabica and robust of the highest quality. We use coffee from all areas of the equatorial belt, Guatemala, Ethiopia, Brazil, Central America. Thanks to the experience and our attitude towards the world of coffee we create mixtures with all the passion, art and skill to give the public a unique experience. We use in particular 8 different types of arabic, which give each blend a unique and unmistakable flavor. The result is that even the most demanding and experienced palates appreciate its taste. The coffee is, moreover, roasted with a slow and accurate working with direct flame and for single origin’s coffee. We respect the roasting and rest times for each kind of coffee. 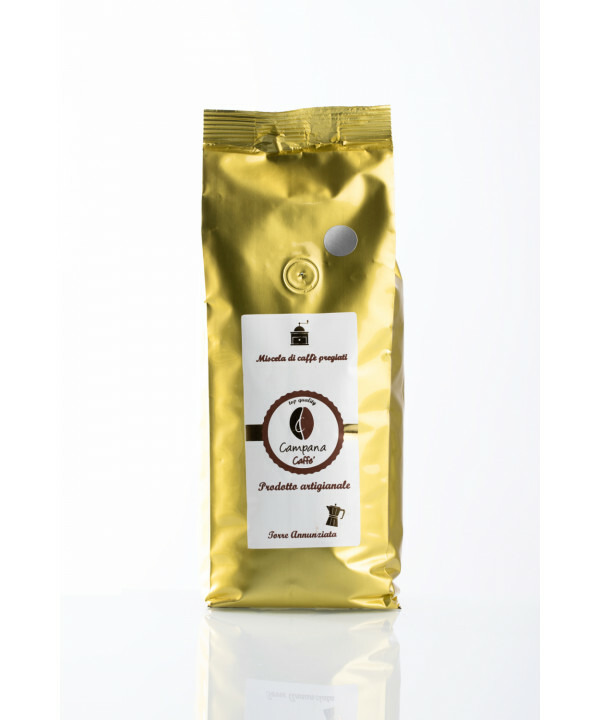 For customers who buy our coffee online and for those who buy it directly in our store, the coffee is ground at the moment, for moka or espresso according to the needs, to ensure maximum freshness, save the ability to buy it in beans . The love for coffee handed down by his father Pasquale has led Lello and Paola to make a full immersion on the culture of coffee, creating the conditions for marrying the company philosophy with that cultural trend known to professionals as a third wave (or third wave) which promotes coffee, finally, in itself, as a craft product, as the wine that can be of high value if all the steps of the supply chain, of the cultivation, of the varieties, of the areas of production, selection, roasting and preparation will be carried out carefully, in fact, artisanal. Therefore we also speak in the jargon of “specialty-coffee”. For this purpose we are against the use of pods and capsules. 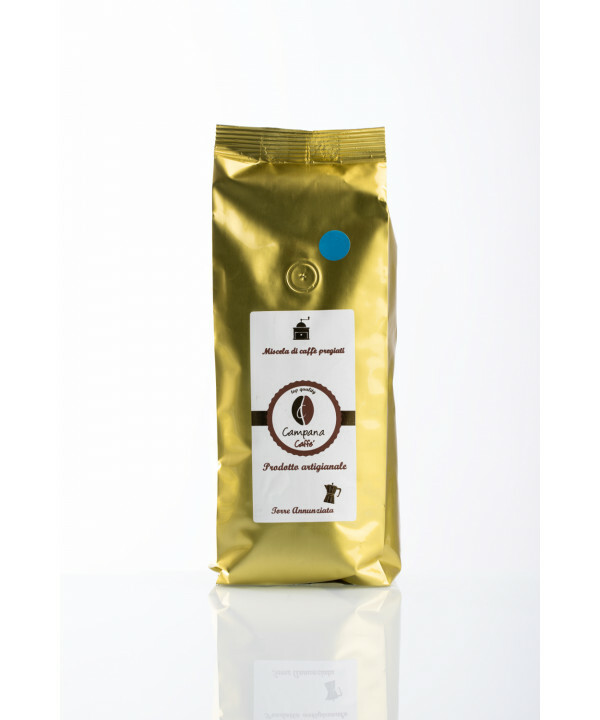 Here you will only find coffee of our production in beans and grinded of the highest quality. Today we are able to offer the public two lines of coffee. The gourmet line with darker roasting typical of the Neapolitan tradition,and the “Campana caffè” brand, with 4 blends that we could define “gradually-arabic-intensity” that is with the presence of arabic increasing from +50% for the Santos blend to 100% for the Extra blend Gold awarded among others by De Longhi and Slow Food. 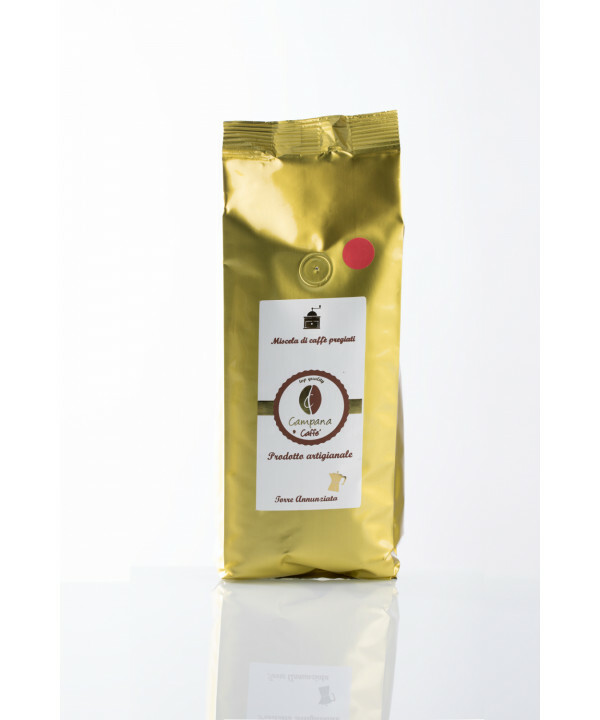 This coffee is also packaged in special gold metalized envelopes with an aroma-saving dagasing valve in 250 gr, 500 gr and 1 Kg formats. Available at roasting and sale point in Torre Annunziata (near Naples) as well as online (ecommerce). The specialty line (coffee) can be tasted at our cafeteria and micro-roasting point in Pompei at via Sacra 44. 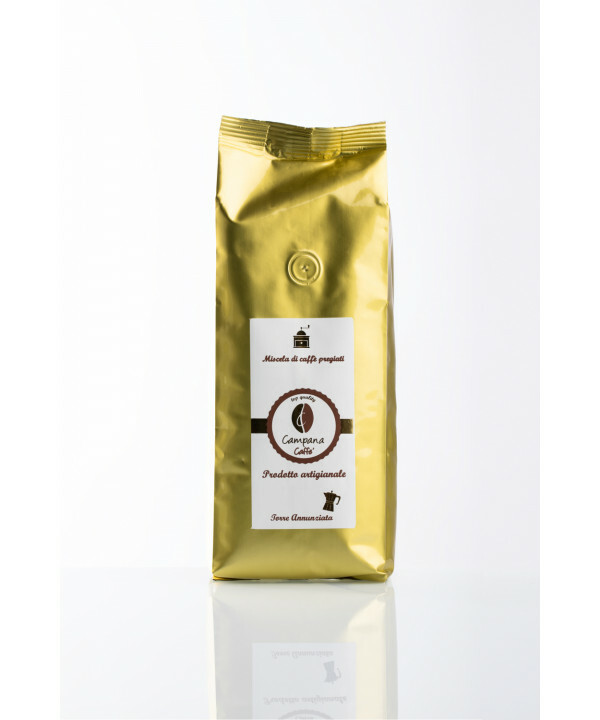 It currently consists of a blend of the house and three different qualities of single origin’s coffee. This line consists exclusively of 100% Arabica coffee of the highest quality because they come from particular plantations located on the African continent and in South America. It also presents a lighter roasting than the gourmet line in order to give more prominence to certain aromas released by individual beans. With the opening in November 2017 of the cafeteria in Pompei we have inaugurated a special coffee shop similar in style to those found in the USA and Australia. Inside the coffee is offered at the counter, preferably without sugar, explaining to the customer at the moment what he is going to taste. The customer has the opportunity to choose which quality to taste and once served is guided by the staff in his tasting-emotional experience. The customer is also encouraged to taste coffee not quickly but slowly according to the philosophy of “slow specialty coffee” (quality coffee slowly tasted). The coffee is offered to the customer on the counter according to different extraction techniques, either in the classic variant of espresso coffee or in the form of filter coffee or extracted with aeropress, v60 or chemex or in the form of American coffee. Obviously we also serve cappuccinos in Latteart mode. At the same time you will be able to taste croissants, cakes, biscuits and buy slow-food / organic products as well as the single specialty coffee varieties in 250g format and in the innovative “stand up” black coffee bag with customized labels and brand. In short, we try to do our best to offer a different product on the market, characterized by that lost craftsmanship. We are convinced that quality is the basis for the satisfaction of our customers.